Continuing on the topic of eliminating foods (see Eliminating Foods, Part I), I want to discuss a possible obstacle you might encounter if you are trying to eliminate unhealthy foods while also attempting to quit binge eating. The reason I want to address this topic is because I’ve heard from many people who truly desire to have a very healthy diet, and don’t want any processed/”junk” foods in their life; and while this can be a worthwhile goal to have, it ends up complicating recovery for some people. 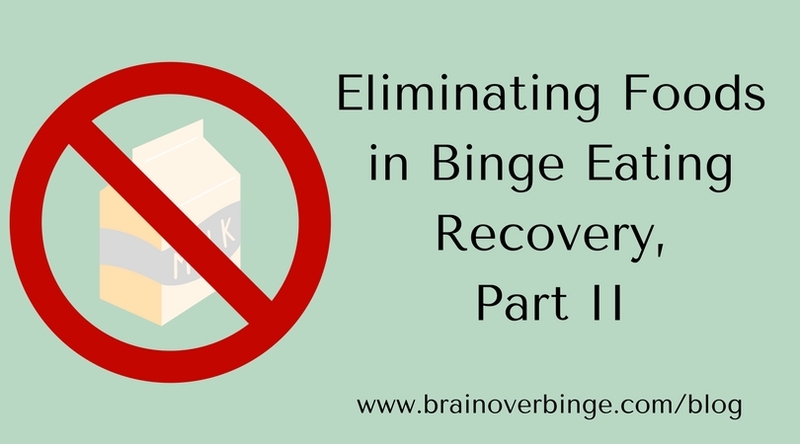 The binge eater merges the part of themselves that wants to binge with the part of themselves that wants the foods they are trying to eliminate. They begin to apply the lower brain/higher brain idea to the consumption of any junk food, by viewing their lower brain as their “unhealthy eating” brain, and their higher brain as their “healthy/clean eating brain.” I don’t think this is useful, especially when first trying to quit binge eating, because it can lead to an “all or nothing” trap. Everyone has food cravings, but when you start trying to view all of your cravings for anything unhealthy as neurological junk, it can be overwhelming. It can lead you to believe that if you follow a desire for a dessert, or some processed/fast food that your lower brain has already won. “See, you can’t control yourself,” your addicted brain will say, “you might as well binge.” And, you might be primed to believe it because in your mind you have hard proof that you are weak – after all, you ate unhealthy food when you were committed to a good diet. Try not to think that you have a “good brain” and a “bad brain.” This is not the case at all. Your primal brain with it’s pleasure centers might indeed be behind your cravings for some junk food, but everyone has this, and has to decide to what extent to follow those cravings. Craving some french fries doesn’t make you abnormal or weak, and it certainly doesn’t mean your animal brain controls you. If you choose to have the fries, great…enjoy them! If you choose not to, then that’s great too…have some carrot sticks with almond butter instead:-) Don’t think that if you choose the french fries you are giving into a binge urge. Likewise, don’t think that if you decide on the carrot sticks, that depriving yourself of the fries will lead you to binge. It won’t. There will be other opportunities for fries. Try to keep this simple – make your food choices and move on, knowing that it’s only the binge urges that you are trying to correct right now. If you follow my blog, you’ll know that I personally don’t think that eliminating all unhealthy foods while trying to quit binge eating is the best course of action; but I understand the reasons for it, and I appreciate that people want to be healthy. If you truly want to eliminate a certain food group or all processed foods for health reasons, try to keep that endeavor separate from quitting binge eating. Then, even if you aren’t able to eliminate the foods you don’t want in your diet, you can still completely recover from bulimia or BED. In my next post, I’ll talk about the importance of replacing foods you are trying to eliminate and not letting your attempts to eat healthy turn into restrictive dieting.